The worldâ€™s first Undersea Resort represents a new travel trend. Enjoy the ultimate in sea views from your undersea suite just off a pristine Fiji island. 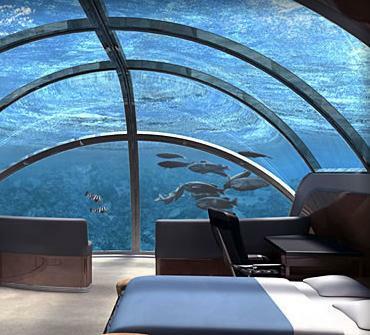 The world's first Undersea Resort represents a new travel trend. Enjoy the ultimate in sea views from your undersea suite just off a pristine Fiji island. Poseidon Undersea Resort is the first undersea resort in the world. This brand new resort has been established on a mystery Fiji island. Poseidon Mystery Island consists of an exclusive luxury island resort together with their revolutionary undersea resort facilities. Take an elevator 40 feet underwater to explore the Poseidon Undersea Resort. From a central corridor, there are 24 undersea capsules for your ultimate undersea accommodation experience. Most of the suite is enveloped in 4 inch thick acrylic to offer you the ultimate sea view - coral gardens, visiting fish and the crystal clear ocean stretching out beyond. The Undersea Resort has an undersea restaurant/lounge, underwater library and even an undersea wedding chapel for the ultimate underwater wedding. Travel Packages to Poseidon Mystery Island consist of a week of bliss on the island itself, with two nights spent undersea. Explore the bay in a personal 3-person Triton submarine or try a sea trek on the seabed! There is every sort of water sport and water activity imaginable, or relax at the treetop bar or enjoy the romance of a hammock made for two. Poseidon Mystery Island has a golf course, spa and conferencing facilities. Exclusive use of the whole of Poseidon Mystery Island for a week will set you back U$3,000,000! Bookings will be open from early 2010. For a bayside experience with a difference try the world's first undersea resort. Sure Giltedge Travel offers travel packages to the Exotic east, see Europe by rail or tour the Americas, cruises, holiday packages and much more, all your travel requirements are met with Aniska Viljoe, your local travel consultant. Caicos Tours Limited presents: Provo?s Greatest Adventure! an Undersea Explorer Expedition in Providenciales in a glass bottom semi-submarine, experience the fascinating ?underwater world? without getting wet! Don't Tell Mama Restaurant offers New York City's finest fusion New American Cuisine from a seasonally changing menu. Enjoy all American favourites, delicious ingredients, and something for everyone with daily lunch and dinner specials available. The atmosphere is cozy, the intimacy of a warm living room abounds as diners delight in the wonderful meals on offer, and afterwards enjoy a drink in the piano bar or a live cabaret show in the cabaret room. Brandy Library in New York offer an exclusive spot in New York for dining, wining, bourbons and really rare spirits, and even a menu of 100 classic and signature cocktails. Light jazz tinkles in the background and on Mondays, the live piano music sets the tone for a wonderful evening of decadent cuisine and carefully chosen wines, beers and spirits. Brandy Library is also the perfect venue to host your next private party or celebration and even has a spirit school and Spirit Sommeliers. Beekmans Beer Garden Beach Club in fabulous New York is the perfect venue for your next event. Enjoy this New York Beer gardens varied menu of sausages, seafood, snacks, burgers, sides, BBQ's and more as you dine outdoors, or party into the night beach side. The beer garden offers a wonderful setting with stunning views, comfortable chairs and open fires and Beekmans Beer Garden Beach Clubs hosts concerts and events throughout the year. Make this stunning venue your location for your next birthday party, corporate event, or fundraiser, it's all happening at Beekmans Beer Garden Beach Club in New York. Schooner Travel Ltd. specializes in the full range of corporate and leisure travel products and destinations, including cruise vacations, sun packages, air and rail tickets, motorcoach tours, travel insurance, and much more. Island Paradise Charters in New Port Richey, Florida, offers exciting and fun boat charters on a 40 foot aluminum catamaran with seating for up to 38 people with facilities that include a wet bar, vanity restrooms, dance floor, loan binoculars for up-close views of beautiful wildlife along the way. We also offer enjoyable inshore or offshore fishing charters that include fishing license, baits, tackle and everything else you may need for exciting fishing trips. River Adventure Cruises with Island Paradise Charters offers fun cruising along the Pithlachascotee or Anclote rivers, we also offer snorkeling excursions dolphin tours, sunset boat cruises, dinner cruises, romantic island weddings and many more exciting charters.